Apparently, the beef between Golden State Warriors teammates Kevin Durant and Draymond Green is still simmering. The bad blood boiled during the Warriors' overtime loss to the Los Angeles Clippers, 121-116, when the two jawed at each other after Green didn't give the ball to Durant in the last seconds and turned it over. Golden State then suspended Draymond without pay in their game against the Atlanta Hawks for conduct detrimental to the team when he reportedly called Kevin names. Meanwhile, KD recently confirmed that they have yet to talk about the matter. He told ESPN, "I'm gonna keep that in-house. That's what we do here. I mean, obviously I know you guys got a job to do, but I'm not trying to give nobody no headlines. What happened, happened. We're trying to move on—just trying to play basketball." While the rest of the NBA brought out their popcorn and were waiting for an ugly fallout from the threepeat-seeking champions, basketball personalities shared their thoughts on the situation. Jalen Rose on Get Up! : "You have to give the ball to Kevin Durant. No question about it. The signature play for KD once he joined the Golden State Warriors is when he dribbled up the left side at Cleveland and he shot down LeBron James from 35 feet and made a three." Max Kellerman on First Take: "I think they both have points of view. I understand it. I would say that ultimately, I agree with you Stephen A., game on the line, no Steph Curry, KD is the guy." Adrian Wojnarowski on SportsCenter: "(The organization had) a lot of soul-searching about handing down a suspension, costing Green money, and essentially siding with Durant. The concern is, do players start lining up behind different players in the aftermath of this." Tracy McGrady on The Jump: "The suspension was definitely warranted. Absolutely. From what I hear, I don't care if you're on the street (or a) professional environment, the words that he (Green) called this man, you don't say that to another individual. And I just think he crossed the line." Shannon Sharpe on UNDISPUTED: "It's not a big deal. it's two guys that are super duper competitive. 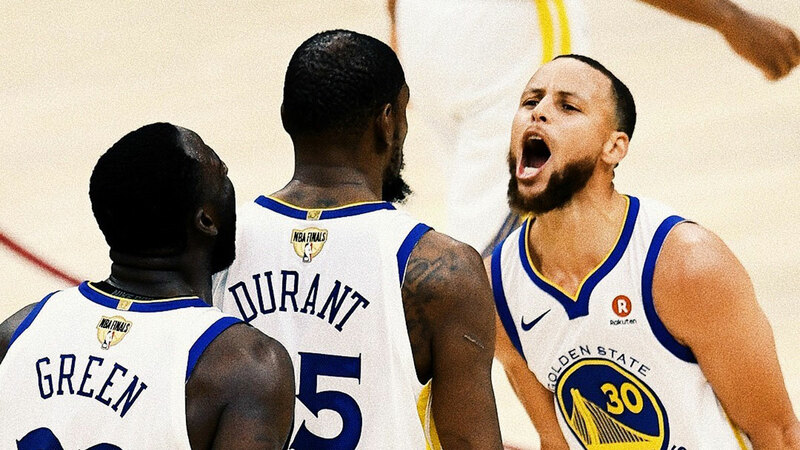 But I can assure you, in the endgame situation, under no circumstances, if KD, Steph Curry, and Klay Thompson is Available, should Draymond Green have the ball."